OK, the title has a whole bunch of acronyms which may not be entirely familiar. Actually…if we’re being really picky I should probably say a whole bunch of initialisms, but that would digress into a whole different article when a perfectly good Wikipedia article already exists for that. Anyway, PTA is the accepted short form of Pass-Through Authentication – one of the range of authentication options available with Azure Active Directory. AADJ stands for Azure Active Directory Domain Join(ed). This is a state for a Windows 10 machine in which it is joined to Azure Active Directory for a given tenant organisation. It is materially different to Azure AD Device Registration and Hybrid Azure AD Join, as neatly described here. So what’s the problem with setting this flag in our PTA, AADJ scenario? Well, quite simply the user won’t be able to sign-in to their Windows 10 machine. Instead of the user being prompted to change their password when entering the credentials that include the temporary password, the user sees the generic, “The user name or password is incorrect. Try again”. Hopefully Microsoft will provide a resolution to this in the near future. At the time of writing the behaviour is seen as “by design” in so far as the error generated on the DC to which the credentials have been passed cannot be successfully translated back to the point where the sign in attempt occurs. 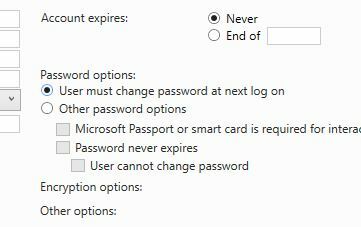 Posted by admin on April 13, 2018 at 5:06 pm under Active Directory, Azure Active Directory, Pass-Through Authentication.